One the first tasks of the Cataraqui Source Protection Committee was to prepare a terms of reference under the Clean Water Act. The terms of reference acted as a work plan for the source protection planning process to guide research and planning, assign roles and responsibilities, and establish timelines and estimate funding. The terms of reference was open to public review and comment during its development. 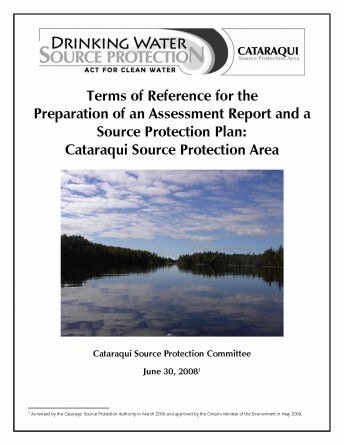 The Cataraqui terms of reference was submitted to the Minister of the Environment and Climate Change on September 25, 2008. The Minister of the Environment and Climate Change approved the terms of reference on May 11, 2009.